It all started one year ago around this time, the Asian supermarket near my house was having radishes on sales at 10 cents per lb, I had to bring some back and made a batch of Chai Poh/Preserved Radish. The Chai Poh turned out really well, so earlier in July this year, when the price of radishes in the local market is low again, I made yet another batch of Chai Poh. This time I have better understanding of the timing and the Chai Poh turned out even better than the last batch. Since I have so many homemade Chai Poh sitting in my pantry now, I can't help but to keep thinking of ways to use them. 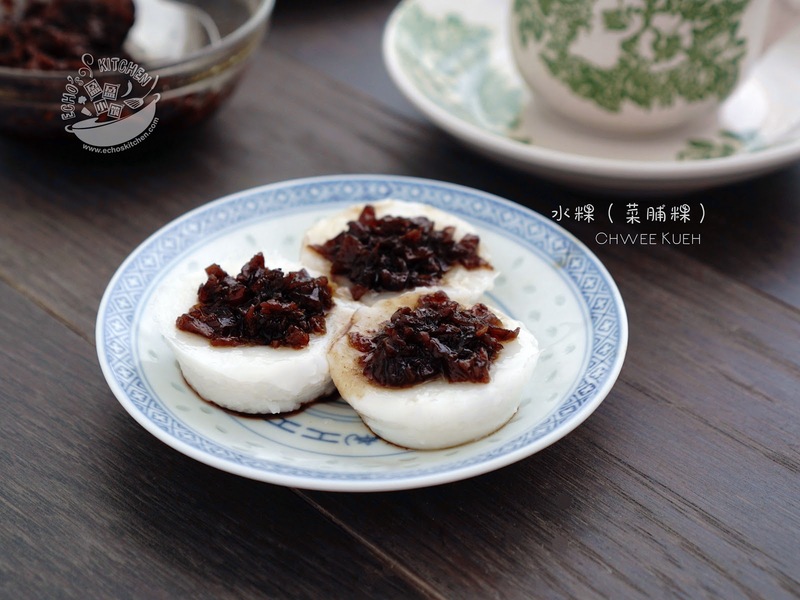 This Chwee Kueh made it to the top of my list, Chwee Kueh is a snack close to many Malaysian/Singaporean's hearts, a breakfast or teatime choice for many when we were home. A good Chwee Kueh is full of fragrance of rice, it melts in your mouth with the bits and pieces of Chai Poh toppings giving it the crunchiness and flavors that it needs. The duo compliment each other and their unique taste are there to stay in my memories. There are a few recipes of Chwee Kueh online, I have tried one of them, and it turned out okay, but in my opinion, does make the real Chwee Kueh. 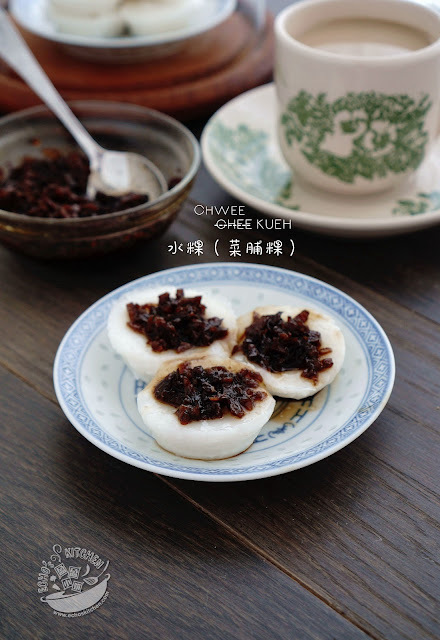 The original Chwee Kueh is made only with ground rice and water, when steamed at high heat, the kueh will form a natural dent in the middle which make a perfect shape to fill and hold the toppings. Since I wanted nothing but the original taste of Chwee Kueh, I took it to heart to experiment and make the kueh from scratch! I read all the information I could find on the making of this kueh and experimented 5 times before I could come to this recipe of mine. 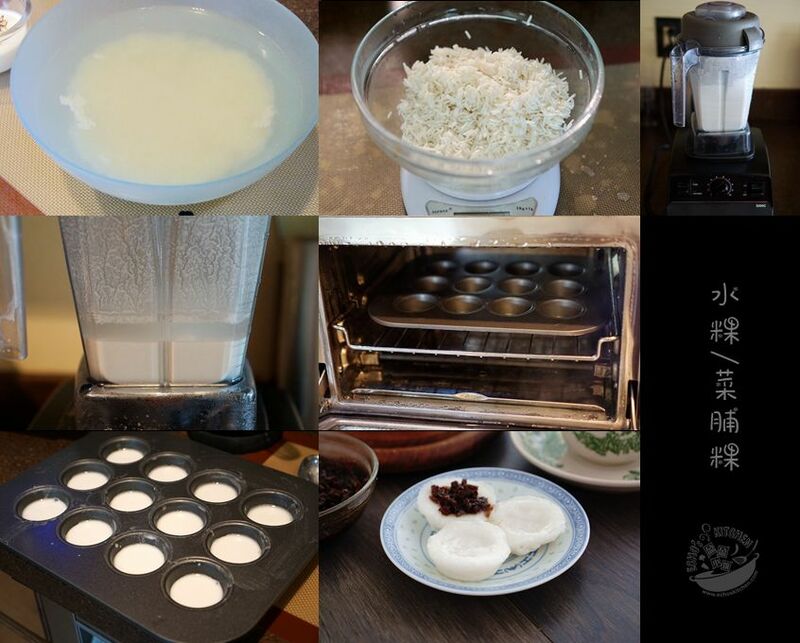 If you like Chwee Kueh, here is my recipe to share! 1. Clean and mince the preserved radish/Chai poh, soak in warm water if you prefer less saltiness, you can find ready minced chai poh from the shop, which saved you this step in the cooking. 2. 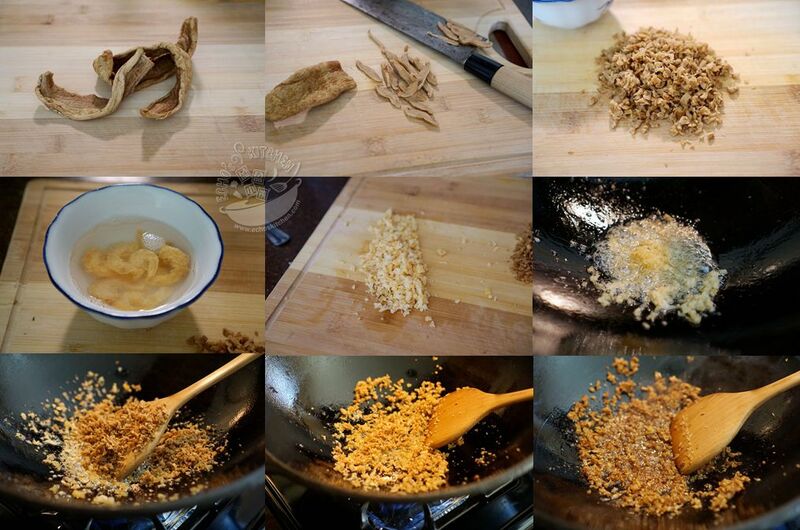 Soak dried shrimps in hot water for 5 minutes, minced and keep aside. Mince 2 cloves of garlic and keep aside. 3. Heat up about 2-3 tbsp of oil in a cooking pan/wok, add the minced dried shrimp and cook at medium heat for about 30 seconds, add the minced garlic, stir until fragrant, add the minced Chai Poh, continue cooking until the Chai Poh is fragrant and is a little crunchy to look at. 4. Add all the seasoning and water, bring to boil and cook at medium heat for about 3-5 minutes. 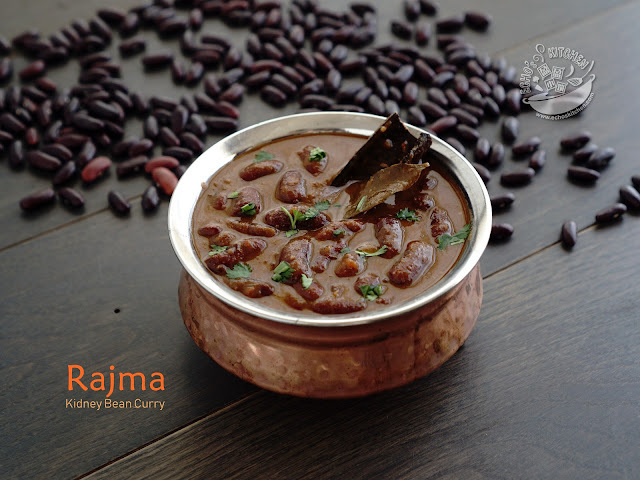 Take it out in a bowl and let cool. 5. Wash and soak the long grain rice overnight, if you like the Chwee kueh a little crunchier, soak the rice for 2 days, change the water 2-3 times in between. 6. Drain the rice and weigh it again the next day, the Basmati rice I used took in about 40% of water, thus it was 140 g when I weigh it. The ratio of rice and water to make Chwee Kueh is around 1: 2.5-2.8. We will need about 260-280 g of water for the recipe. Since the rice soaked up 40 g of water already, we now need about 220 g of water for blending. 7. Place the rice and 220 g of water with a pinch of salt and wheat starch (if you are using) in a blender, blend until smooth, let the mixture rest for 10 minutes, you will now see that the water and rice is separated, this is a good time to check if the water, rice ratio is right, the level of clear water and rice should be about 1: 2.5, if the clear water part is too less/thin, add some water, if it is too thick, take some water out. 8. Run the blender again until smooth, and let the mixture rest for another 10 minutes. Meanwhile, set a steamer on the stove and heat the molds in the steamer for 5 minutes, this is a very important step to ease de-molding when the cake is done. You can use small bowls, Chinese tea cups to make this Chwee Kueh, since I am steaming the Kueh in my steamer oven, I used my son's mini muffin tin, which was perfect. 9. Once the molds are heated, run the blender again until smooth, fill each mold with rice mixture to about 70% full, steam the rice cake at high heat for 15 minutes. Take the cake out immediately when it is done and let cool. Once cooled the cake will have a small dent in the middle that resemble a small bowl. 10. Add a little Chai Poh topping on each Chwee Kueh and serve with some chili sauce.